With the overall outlook for the UK economy looking comparatively dull for the next five years, Manchester's economy continues to impress. 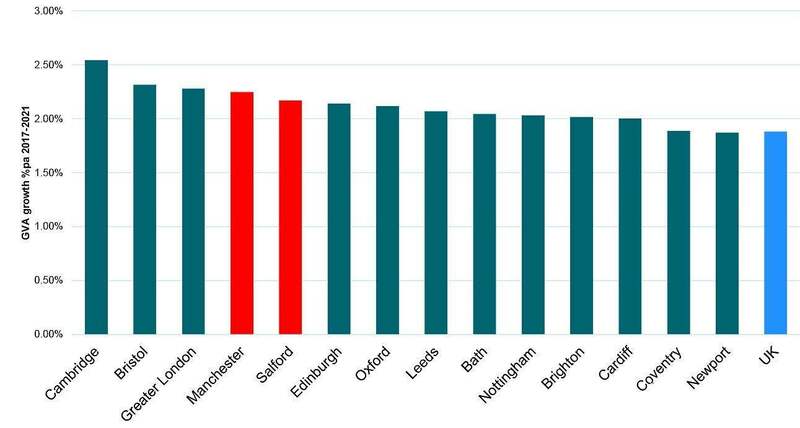 Indeed, as Graph 1 shows, the outlook for Manchester and Salford is more in line with that of London and the best towns of the South than with the other regional centres. One of the main reasons why Manchester's growth story is so good is that its office-based economy is biased towards growth industries such as the Professions, and away from those that are projected to grow less strongly or contract (e.g. the Public sector and Finance). Furthermore, the City still offers a broad and deep labour pool for organisations who are looking to expand away from London for cost reasons. 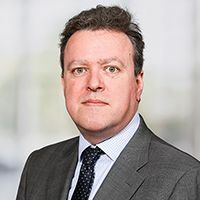 While significant questions still hang over the outlook for the financial services industry in the UK post Brexit, these questions are more about crossborder financial services than those targeted at the UK. Thus, while 12% of Manchester's office-based jobs are in the finance sector, we expect to see less rationalisation as a result of Brexit in Manchester than in London. The continued growth of the TMT and other sectors will also more than compensate for any declines in headcount in finance or the public sector, and we expect that total office-based employment in Manchester will grow by 4.7% over the next five years. While the strong economic outlook for the City should be giving investor demand a boost, the actual transactional volume in the first half of 2017 was low. Indeed, at only £169 million the market was 52% down year on year and 27% down on the 10-year average (Graph 2). The main reason for the low level of transactional volume is a shortage of vendors, particularly of prime stock. 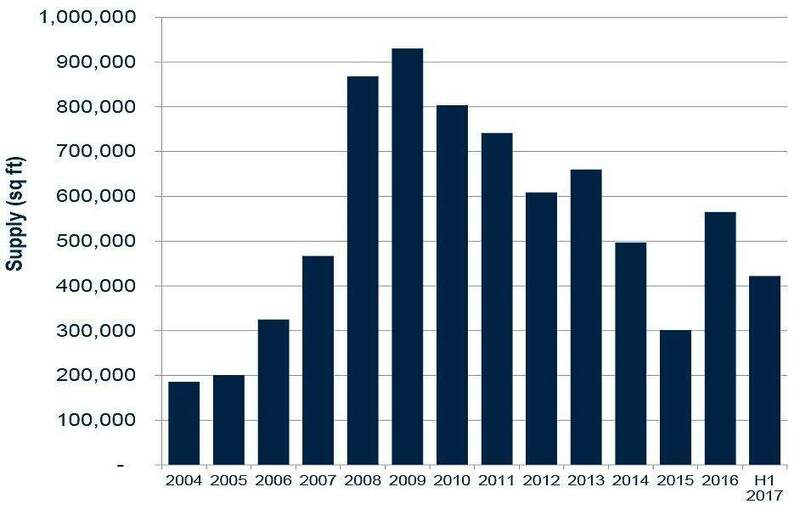 The majority of the City's office developments that were completed in 2014–16 have changed hands in recent years, and this means that there is a very limited pool of newly developed and well-let assets to come to the market to satisfy risk-averse investor's requirements. The limited supply of prime assets coming to the market has kept prime yields low at 5%, and this is another factor that has limited investment activity. However, while this yield might seem keen to the domestic investors, it is comparatively attractive to European and APAC investors, and we expect to see more non-domestic demand for assets in the City in the remainder of 2017 and 2018. While non-domestic investors will continue to focus on core assets, we believe that domestic investors should start to pay more attention to value-add and opportunistic opportunities in the City, whether this is in less sought-after locations such as South Manchester, or in development and refurbishment opportunities in the core. The strong economic outlook, tight occupational market, and rising rents in the core will continue to support the delivery of new stock in the next few years. Also, as we have commented upon in previous Spotlights, we expect the trend of in-migration from the region's sub-regional centres to Manchester to continue as employers react to the role urban areas play in staff attraction and retention. While these local occupiers might balk at the uplift in rents that would be involved in a move from Chester to Spinningfields, the differential is more palatable when you look at refurbishments in edge of core locations such as Oxford Road or South Manchester. With yields in South Manchester at 7.5%, and even on the edge of the City core at 5.75%, the most interesting investment opportunities in the City going forward will probably be in the edge of the core markets. 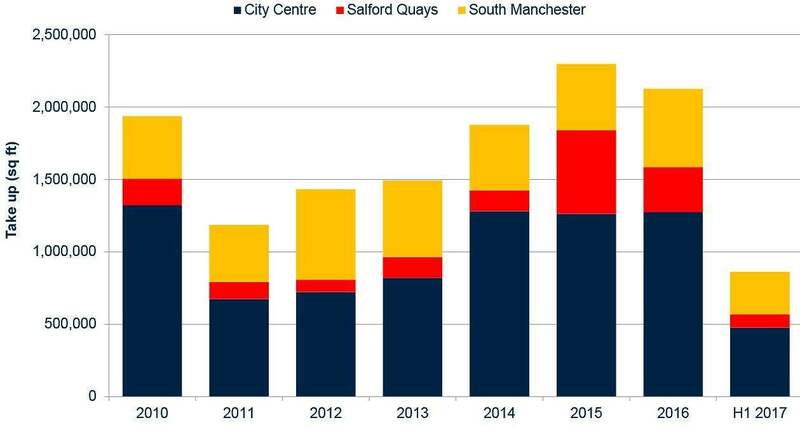 Overall take-up across the City Centre, Salford Quays and South Manchester in the first half of 2017 was just under 860,000 sq ft, 20% higher than the same period in 2016 (Graph 3). All three submarkets saw a year on year increase in leasing activity, with South Manchester seeing the strongest uplift with a 29% rise. The City Centre market saw a more muted 17% increase in take-up compared to last year, with the second quarter substantially more active than the first. The robust level of take-up was driven by strong demand from the Business Services, TMT and Finance sectors. However, the sector that grew most this year in relation to its longer term role was serviced offices, which accounted for 11.7% of the space leased in the first half of 2017. This is a dramatic increase, given that this sector only acquired 1.7% of the space leased in Manchester in 2012–16. While all of this take-up was in one transaction (WeWork's 55,802 sq ft at No. 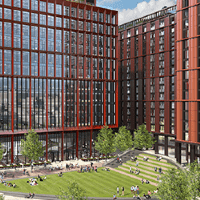 1 Spinningfields), this will not be the end of the serviced office story for Manchester. All of the major serviced office operators have stated that Manchester is on their target list, and thus we expect the importance of this sector to the Manchester office market to mirror what has happened in London in recent years. Indeed, the similarities between London and Manchester are considerable, with the serviced office sector accounting for less than 2% of London's take-up prior to 2012, and then booming to nearly 16% in 2017. Another area where serviced office operator demand may be significant in Manchester is on the supply-side. 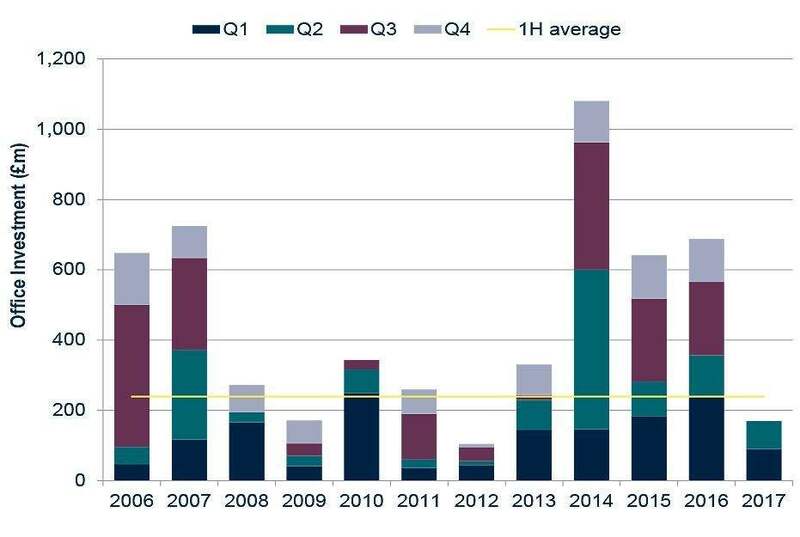 Overall Grade A supply has fallen from 565,311 sq ft at end of 2016 to 422,008 sq ft at the half year, but the overall availability in the City centre remains high (Graph 4). While the last few years has seen a rise in refurbishment activity that has changed some of the Grade B to Grade A space, there is still 1.7m sq ft of available space in the City centre that is not Grade A (against a longrun average take-up of such space of just over 630,000 sq ft per annum). Looking ahead we expect to see some of this Grade B space taken up by serviced office operators who offer at lower price points, as well as some refurbishment opportunities actually being bought for their own occupation by Regus and WeWork. Above average take-up levels in 2017 and 2018 will lead to a steady fall in the overall City centre vacancy rate, pushing it back into single-digits. This will stimulate a new round of development and refurbishment starts in the medium term. However, in the short term the story, at least for Grade A space in the City centre, will be one of increasing undersupply and rising rents. The highest rent that was achieved in the first half of 2017 was £33.50/ sq ft on the 7th floor at Two St Peter's Square. 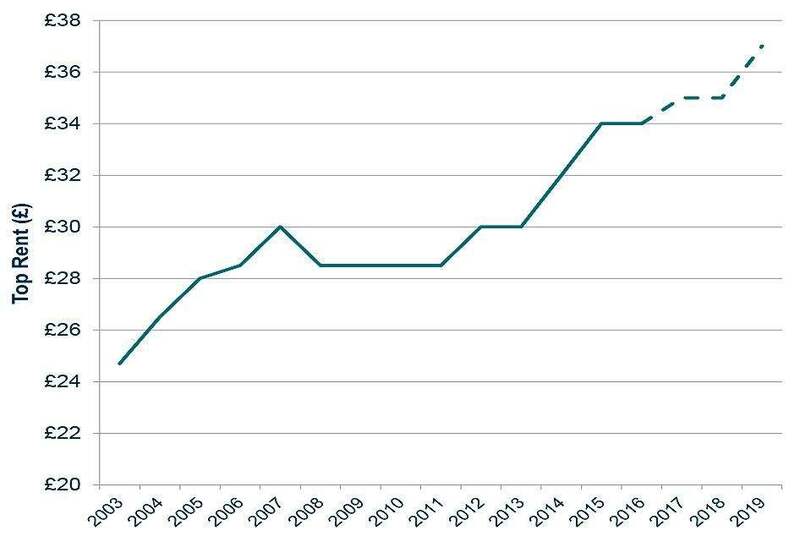 While this is not an increase on 2016, we expect that the steadily falling Grade A supply in 2018 and 2019 will put further upward pressure on prime rents (taking them to £37/sq ft by 2019). While this would not be the highest rental level in a UK regional city (Cambridge is now £36.50/sq ft), it would be a record for Manchester. This will present a challenge for local occupiers, and is another reason why we expect to see an expansion of the more affordable fringe locations on the edge of the CBD. While Manchester still offers an attractive differential to London both in terms of rent and staff costs, it is worth noting that the 'northshoring' argument becomes increasingly weak the more that gap narrows. If office rents start to fall in London (as we expect they will do), some parts of London may offer lower office rents than the core of Manchester! However, over the next few years we expect that the combination of tight supply and cautious developer and investor sentiment will keep rents in the core high, and thus stimulate some tenants to look towards more affordable buildings on the fringe of the CBD. Manchester has long been at the forefront of new media in the UK and the recent Tech Nation 2017 report estimated that the City currently supports 62,653 digital jobs creating an output of £2.8 billinn per annum. The City's Tech infrastructure is broad-based with strong higher education, high levels of graduate retention and a good mix of accelerators and funding organisations. This will be further enhanced by the opening of Mi-IDEA and the Sir Henry Royce Institute for Advanced Materials in 2019. The Manchester office market has seen more TMT take-up in the last 17 years than any other city outside London, and we expect that is dominance will continue. Key growth areas for the future will include advanced materials, cyber security and digital post-production. The biggest challenge for the City will be providing suitable office space for companies in these sectors. While we expect the big brands to be well catered for, more flexible and affordable office space is needed. With serviced office operators taking nearly 850,000 sq ft of space in London in the first half of 2017 alone there can be no doubt that this is a booming sector. Manchester, as one of the UK's most diverse regional economies, is an obvious second step for operators who are reaching saturation in London. 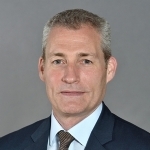 While the differential between market and serviced office rents may be less wide in Manchester than in London, the large supply of second-hand office space in Manchester could present an interesting opportunity for those operators who are well capitalised enough to buy their own buildings. This will remove the variability from their base cost, and enable them to better flex their pricing to fit demand in future. However, the majority of serviced operator demand in Manchester will still be on a leasehold basis, and we expect to see a wider variety of offers emerging in the near future. These will cater to both start-ups and established business in existing and emerging locations. Manchester remains one of the few UK cities that we believe offers a credible northshoring story around wage and property cost savings combined with a large and diverse labour force. In movers from London and elsewhere will continue to be drawn to the best buildings in established locations, and this will keep voids low and drive rents upwards. This will present a challenge for local businesses who are looking to upgrade their office space, and we expect to see more tenant demand being pushed out to the City's northern, southern and western fringes. The rising popularity for refurbished space will mean that a lot of property that hitherto might have been targeted for change of use stays in office uses. This in turn will support a resurgent retail and leisure offer and lead to locations that were previously viewed as 'fringe' becoming 'future core'. Our top picks for the future include the Oxford Road, Irwell Corridor and Ancoats areas.